The great thing about improving a small kitchen is that a few aesthetic changes can make a big impact. This means that there's loads of opportunity to upgrade a small kitchen with a low budget. To start, it helps to think of your fitted cabinets as the starting point for all the accents and accessories that serve to make a kitchen homely. So, come with us to explore a few of the options! 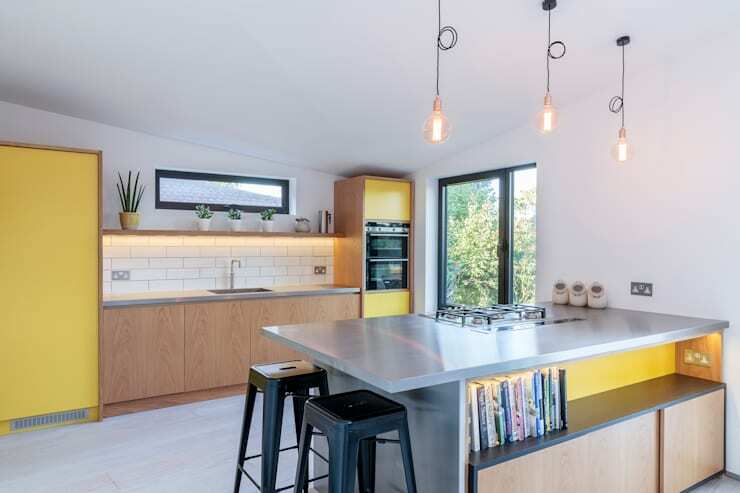 Finally, we're not all about looks here at homify, so we'll also include a few little tips to help just make your small kitchen a nicer place to work in as well. Enjoy! Kitchen appliances are now available in cool retro designs and super bright colours. These appliances are meant to be shown off - not tucked away in a drawer. So consider investing in a new toaster or kettle. 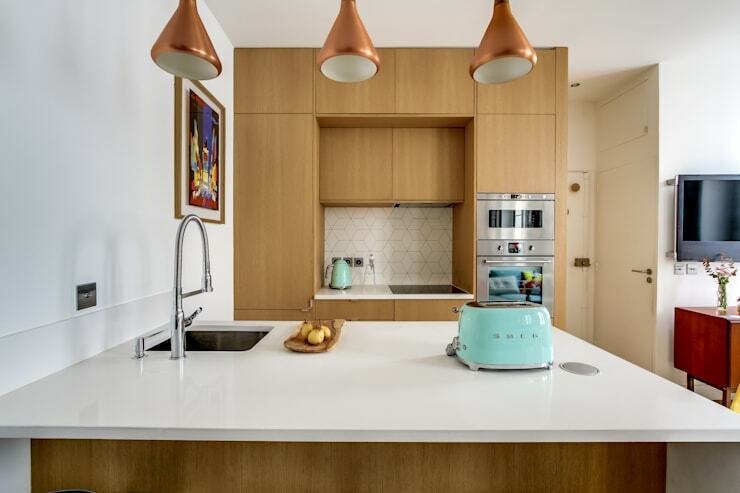 Perhaps you might even draw attention to the brightly coloured new appliance with some matching kitchen towels as well. If you don't like the tiles on your walls or just want to add a little more interactive pizzazz to the small kitchen - install a large blackboard. 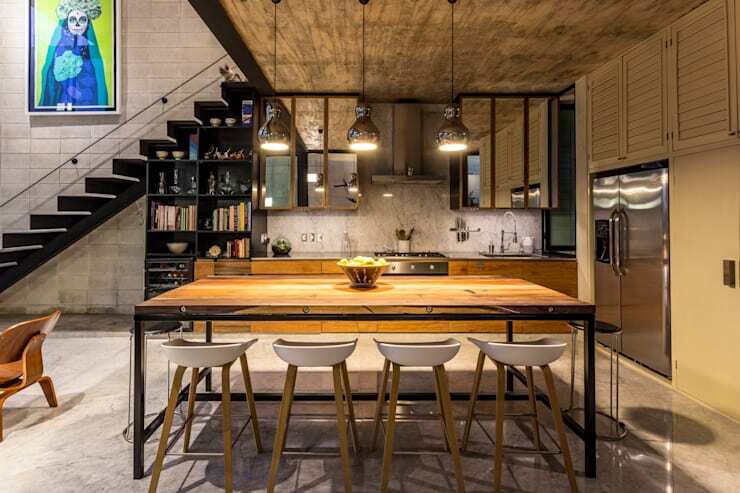 If you have a rental kitchen, it could even just be propped up against the offending wall. A kitchen blackboard could turn into a spot for inspirational quotes, notes on your favourite recipes or even a place for a little old-fashioned communication between the householders. Many small kitchens come with industrial standard style light fittings. They are often ugly and installed for purely pragmatic reasons. But it's easy enough to replace these. Perhaps you could consider adding some hanging retro lights like this. Another easy option is to attach cheap strip-lights to the underside of your kitchen cabinets. These are surprisingly cheap to buy in major outlets and they can easily be removed if you are worried about damaging a rental home. For power, all you need are some battery powered lights or an electrical outlet close by. Switch plates or light switches are easily the most frequently touched spots in the home and get grubby and scratched very, very quickly. They are also one of the most overlooked items in a room. You don't need an electrician to replace them and the bright new switches will add a clean feel to the room. If you have a little more to invest, consider something a step up from the standard white plastic cover. Perhaps something like these silver switch plates from British company Focus SB might suit. If you have never changed kitchen cupboard doors yourself, the whole prospect may seem a little overwhelming. But in fact, this is one of the easiest ways to completely change a small kitchen on a relatively small budget. And if you want an even cheaper approach, simply change the door handles and knobs. Finally, if you are considering changing the cupboard doors, remember that most base kitchen cabinets come in standard sizes. This means that large home suppliers are very likely to have an exact door to match. There's a good chance the actual door fixtures will just slot into place as well. All you need is a screwdriver! Perhaps you could even spruce up your kitchen with some awesome mirrored kitchen cabinets like this! Small kitchens often have limited countertop space. But this can actually be of benefit if you hate the material or colour. Changing your kitchen countertop is definitely not a low-budget option. 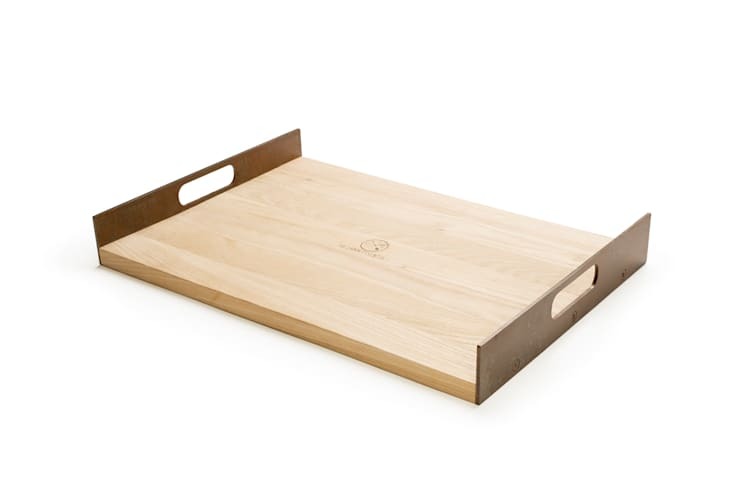 But in a small kitchen, it's often possible to cover up most of an ugly countertop with a huge gorgeous chopping board. 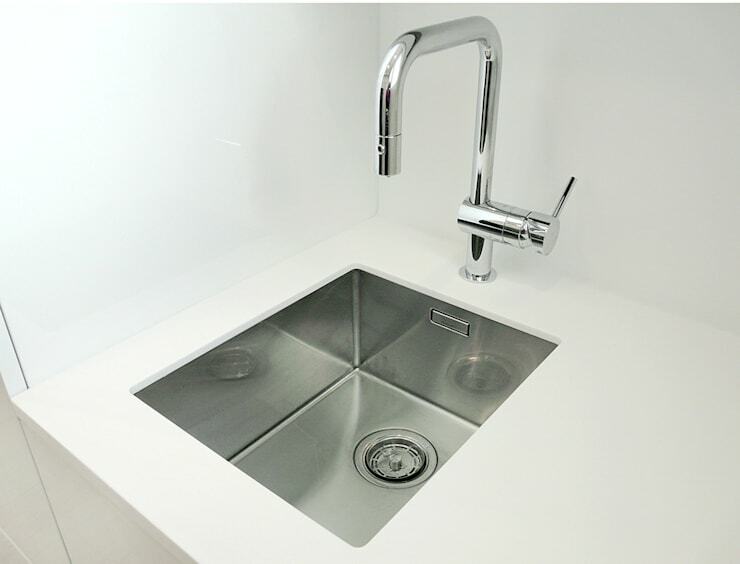 If you have a rental kitchen, this would even be another way to ensure that the original benchtop remains undamaged. This might turn into a permanent fixture in the kitchen and a perpetual solution! Now there's nothing so annoying as a cluttered cupboard, so why not invest in some cheap drawer organisers like these by DesignStudio Speziell? If you are accustomed to rummaging through storage cabinets, a fresh and organised cupboard with everything easily at hand will make a radical difference. On the same note, look at refreshing or adding some drawer liners. They are available online these days in lovely, retro designs. There are a huge amount of ugly dish racks marring otherwise perfectly lovely kitchens. So if you are a bit ho-hum about your dish take, look at investing in something a little more snazzy. If you love the one pictured here, it comes to us courtesy of Simple Human. But there are lots of other great options for wall mounted or even hanging dish racks that collect the water and free up precious bench space. Perhaps you might even find something to highlight some new colour accents in the room. Fregadero de acero inoxidable bajo encimera de Corian. We have all seen films in which a perplexed husband wrestled with a plumbing disaster in the kitchen—but don't fear! It's not actually that hard to replace a tap or faucet on your own. These can be bought relatively cheaply if you really hunt around online. 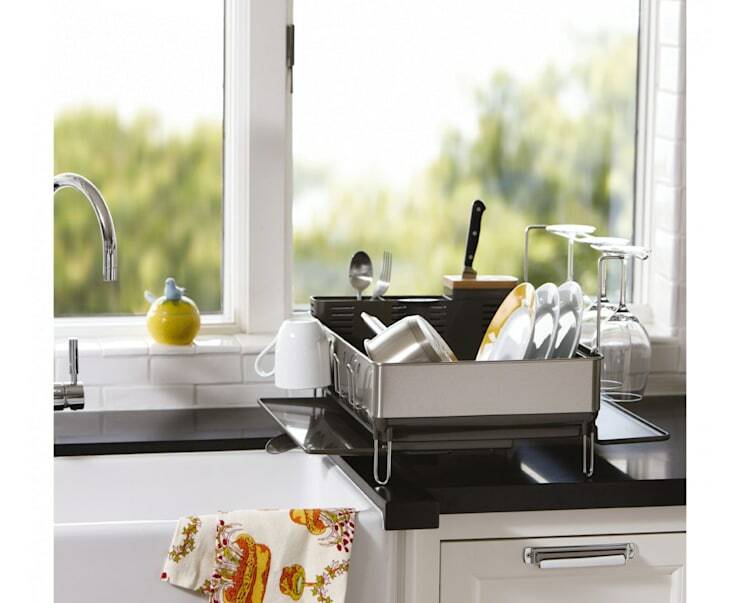 The kitchen sink is a central hub in any kitchen, so this is one area to invest in. 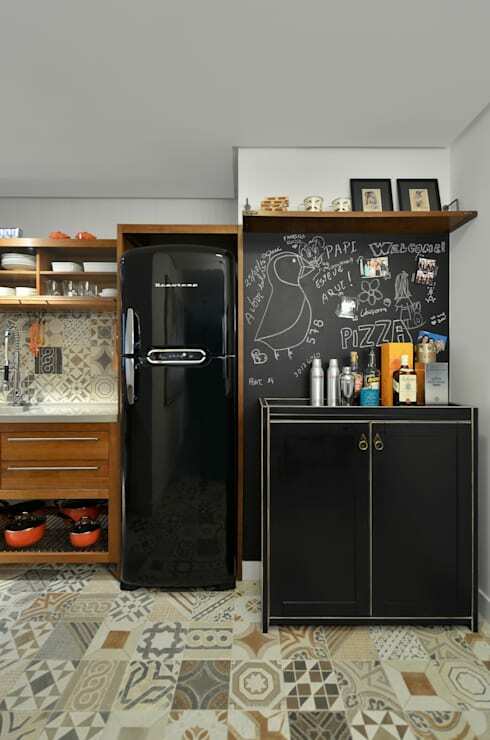 Almost every kitchen could do with more storage. This is particularly true in small kitchens. Look again at all the hidden nooks and crannies in the kitchen and consider where you might install some cheap hooks or hanging baskets. 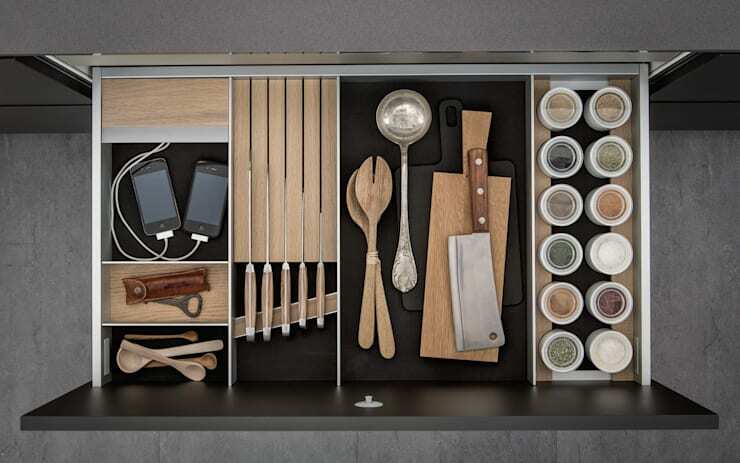 Fine, aluminium storage items can look quite minimalist and chic in the right kitchen. If you have a rental kitchen, there are plenty of temporary options with suction cups that can be easily attached to the walls. Finally, don't forget about houseplants! These are relatively cheap and will look fabulous hanging from the ceiling or placed on an open shelf. If you are looking for more clever ways to improve a small home, you'll love How to Create Space in a Tiny Bathroom. What do you think of theses low-budget kitchen ideas? Let us know if you have any tips for our readers!